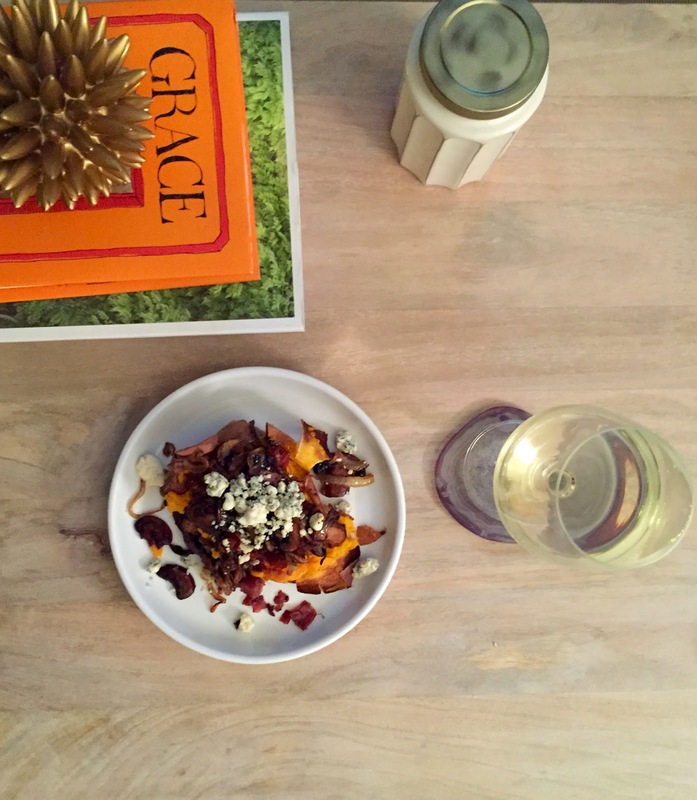 heather & olive: baked stuffed sweet potatoes. Last Thursday was one of those nights where you don't feel like ordering in (because you know you have perfectly good food in the fridge) but you also don't feel like running out to the store for a few missing ingredients. I decided to make do with what I had in the kitchen and the results were absolutely delicious. 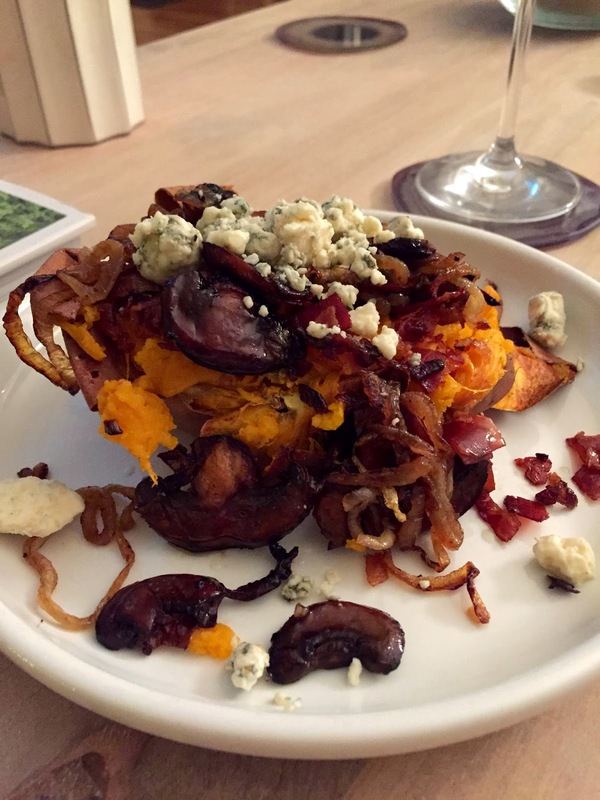 I took some sad-looking sweet potatoes, gave them a good bake, and then topped with caramelized onions, balsamic mushrooms, crispy prosciutto and blue cheese crumbles. Preheat oven to 425 degrees. Place sweet potatoes on a foil-lined baking sheet, and pierce with a fork. Once preheated, the potatoes should cook for 55-65 minutes until tender. While the potatoes cook, heat 1 tablespoon of olive oil and one tablespoon of butter in a pan. Cut up the onion into thin slices, and when the oil/butter is hot, cook on medium low until caramelized, stirring occasionally. (Low and slow is key here--I alway get a little impatient and end up burning them, but if you take your time you'll end up with golden, caramelly goodness). Heat up a teaspoon of olive oil over medium and add mushrooms. Add a couple of glugs of balsamic vinegar, and simmer until the liquid cooks off. Heat up another teaspoon of olive oil in a pan over medium heat, add a clove of minced garlic to the pan and add chopped prosciutto. Cook until crispy, then dry on paper towels. Once potatoes are done, cut into the skin and mash them up. Top with onions, mushrooms, prosciutto and blue cheese crumbles. This recipe isn't groundbreaking by any means, but it's so good--the flavor combos are amazing and it's a party in your mouth. Not too shabby for a Thursday. Sounds delicious. I would never have any of that in my house...except many an onion!!! Love sweet potatoes, but I get so impatient waiting for them to bake! um, YUM. this looks incredible!! and your picture is beautiful!